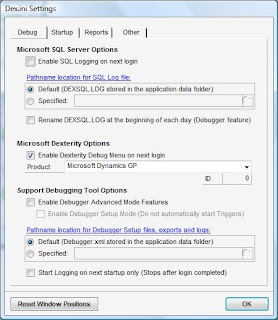 I have been beta testing the Support Debugging Tool (SDT) for Dynamics GP for a couple of weeks. My first impressions orbited around admiration for the author, none other than David Musgrave, followed by the natural curiosity on the powerful features provided by the tool itself. The product is compatible with releases 8.0, 9.0, and 10.0. SDT was first introduced during the Microsoft Dynamics GP Technical Airlift , in May of 2008 with great reception from the attending partner community. Unlike the Script Debugger Tool (activated by including ScriptDebugger = TRUE in the Dex.ini file) Support Debugging Tool is geared towards the consultant and end-user to assist in troubleshooting application issues without the complexities involved in understanding the application development process. The Support Debugging Tool offers two modes of operation: Standard Mode and Advanced Mode. The Standard Mode is a read-only mode which helps with application logging and providing resource and security information. The Advanced Mode adds triggering and scripting capabilities, data export and import and dictionary control. The Advanced Mode is activated by controlling settings in the Dex.ini file -- all from the interface and without leaving Dynamics GP! This mode of operation has been conceived with the systems administrator and partner support staff in mind since it delivers powerful options including the ability to visualize table data and change Dynamics GP's behavior by enabling and disabling features. This is what I call Support Debugging Tool on steroids and definitely not made for the end-user. 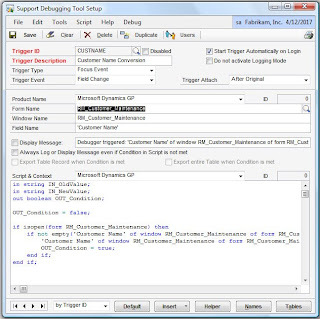 Support Debugging Tool was created with one thing in mind: absolute traceability of the Dynamics GP application events and full control of the application settings. At the heart of its existence is the Automatic Debugger Mode. The Automatic Debugger Mode uses the logging options and Dexterity triggers to log application and SQL activity up to a specific event and error condition. You read correctly! Now you have the ability to trace scripts up to the point of a condition leading to a breakdown in the application logic, which results in an error in the data being written in the tables. However, the use of the Automatic Debugger Mode requires administrative rights and the setup of Dexterity triggers for each event being monitored. For example, if the error condition involves data in a table, the trigger event used could be when the table in question is saved. If the error condition involves a field on a window, the trigger event could be when the field in question is changed. After the trigger event is selected, a conditional script is written using Dexterity sanScript to check whether the error condition has actually occurred. Scripts written for this purpose will require the assistance of an experienced Dexterity developer. · Quickly and simply turn on all logging and profiling capabilities without restarting the application. This can be useful when looking at performance problems. · Finding details about dictionary resources loaded in their customer's environment. · Identifying resources (forms, reports and tables) causing security access issues. · Enabling and disabling third party products or change the order of the products in the launch file. · Exporting data from and importing to any table. · Exporting triggers and configuration options that can be imported and activated in customers production environments. · Running SQL or Dexterity scripts without needing Dexterity or SQL Server administration tools installed. Support Debugging Tool will be available via PartnerSource only. Customer wishing to obtain the tool may request a copy from their partners. Support Debugging Tool will be supported on the Microsoft Dynamics GP Developer's newsgroup. Messages posted there will need to be prefixed by "SDT: " which will prompt the Tools team to respond. For a 41-minutes-and-47-seconds action packed demonstration of Support Debugging Tool features follow this link on Microsoft Partner Program Training center (at least Registered Partner level required). Once the Office Live Meeting presentation is downloaded, you can fast-forward to slide 21 where David takes over. 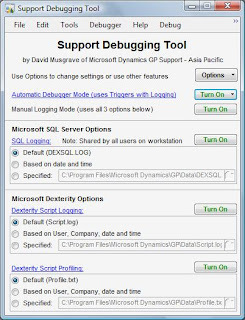 You can also read more about Support Debugging Tool on David's Developing for Dynamics GP blog site or can always refer back to my first article on the tool as well. I got the PowerPoint slides for the Support Debugging Tool session (from Dave's blog). The session you and Dave presented was awesome! An employee had an issue while I was gone, so I am in the process of installing it. Thanks again for all the information from the session. Microsoft Rolls Out SQL Server 2008... Finally!